Challenger bank TSB has partnered with business finance aggregator Funding Options to create a new business lending marketplace. Arriving in May, the new platform will allow business customers to compare TSB loan deals side-by-side with more than 50 other providers. In other news, cryptocurrencies have taken a bit of a battering this week. According to P2P lending platform Assetz Capital, only 16% of investors consider them to be a worthwhile investment, while elsewhere Twitter announced that it is joining Facebook and Google in banning cryptocurrency advertising. 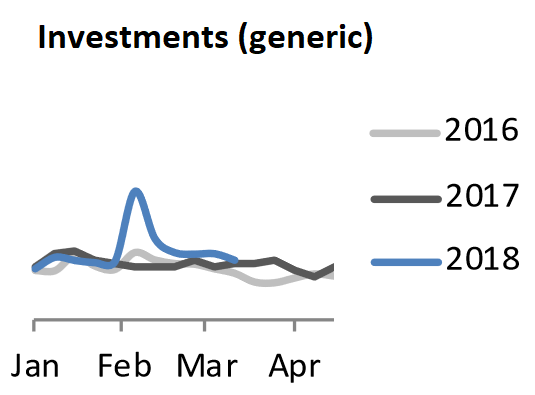 Generic searches for investments are 19% up YOY (albeit driven by a surge in February) showing the desire to find a new home for money. Being GDPR compliant isn’t an option and some businesses are fully aware what they need to do. However, not all businesses are sure about how to go about implementing the necessary steps to achieve full compliance. GDPR - 8 weeks to go!